(BBG) Japan’s Prime Minister Shinzo Abe said he’ll dissolve the lower house of parliament on Sept. 28 for a general election as he announced an $18 billion economic package. At a press conference Monday, Abe unveiled a slew of economic measures including more education spending. He said he’d pay for them with funds from a consumption tax increase originally intended to rein in the nation’s swollen debt. He also spoke about the need to keep up pressure on North Korea after Kim Jong Un’s regime fired two missiles over Japan in recent weeks. Shinzo Abe speaks on September 25. Voting will be set for Oct. 22, according to three people with knowledge of his ruling coalition’s plans. Heightened tensions with North Korea have boosted Abe’s approval rating after a series of scandals, and may help him retain his coalition’s two-thirds majority in the lower house of parliament. “An election in these circumstances will also be a test of confidence in me,” Abe said, adding that he’d resign if his ruling coalition failed to get a simple majority. The yen pared a drop as Abe unveiled the stimulus package and called the election. Ahead of Abe’s remarks, Tokyo Governor Yuriko Koike announced that she would form a new national party to challenge him. Koike, a former member of Abe’s Liberal Democratic Party, said Monday that her “Party of Hope” would run candidates across the nation. Abe announced Monday he had ordered a 2 trillion yen ($18 billion) economic package, including spending on preschool and higher education, as well as improving conditions for people working in elderly care. The premier said he would make use of revenues from a planned increase in the nation’s consumption tax in October 2019 to 10 percent from 8 percent now. He reiterated his strong line on North Korea, saying the current situation on the Korean peninsula was among his reasons for calling the election. Following the announcement, public broadcaster NHK said LDP Vice President Masahiko Komura wouldn’t stand in the election., without providing a reason. A poll published in the Nikkei newspaper on Monday said Abe’s LDP received 44 percent of support, compared to 8 percent for both Koike’s group and the main opposition Democratic Party. Another survey by Kyodo News published on Sunday showed the LDP with a more than three-to-one margin against its closest rival, with 42 percent still undecided. While the Democratic Party is splintering, Koike has a history of local election victories over the premier’s party. After defecting from the LDP, she crushed it in a July election for the metropolitan assembly. Komeito’s Yamaguchi said he hoped she would concentrate on her post in Tokyo. Abe has served a total of almost six years as prime minister: he had a truncated term a decade ago, and came back to power in a landslide in 2012. He could serve until 2021 if re-elected as party leader next year, making him the longest-serving prime minister in Japanese history, though recent polls have shown a majority of voters against this idea. The Nikkei poll showed that 20 percent were undecided, and a majority said it was inappropriate for Abe to dissolve the lower house this month — more than a year before his government’s term is set to expire. Nikkei Research Inc. surveyed 1,044 people aged 18 or older by phone. 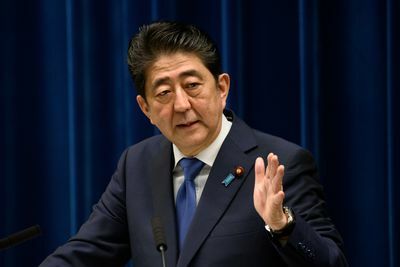 Kyodo reported that its survey conducted over the weekend showed 27 percent of respondents saying they would vote for Abe’s LDP, compared with 8 percent for the Democratic Party. Sixty-four percent said they don’t support his drive for a fresh mandate, the report said, without giving details on the number of respondents or margin of error. Abe’s support is likely to be buoyed by the economy, which has grown for six straight quarters. While unemployment is less than 3 percent, the premier has said wage rises haven’t met his expectations. Tokyo Governor Koike said Monday people did not have a real sense that the economy was improving, and warned that raising the sales tax would pose a risk. She also said debate on constitutional reform should not be avoided. “We need a real force for reform,” Koike told reporters in Tokyo. “By making my position clear, I hope to add energy to the movement,” she added. The new party’s policies will include cutting the number of lawmakers and their pay, improving transparency in government and female empowerment. The ruling coalition currently controls 68 percent of seats in the 475-member lower house, including 288 for the LDP and 35 for its coalition partner Komeito, according to the parliamentary website. The total number of seats is set to be cut to 465 in the next election as part of a reform aimed at reducing the excessive weight given to rural votes under the current system.